May promote weight loss and increase lean muscle mass. Associated with a decrease in cholesterol. Chromium is a trace element described as ‘essential’ because the body cannot make it and it must therefore be obtained from the diet. However, even the diet cannot provide sufficient chromium, especially because cereal-based foods are often refined. In addition, levels of chromium tend to decline as we age and marginal deficiencies are not uncommon. Chromium is essential for protein, fat and carbohydrate metabolism. It plays a fundamental role in converting sugar into energy, in appetite control, reducing cravings for sugary food and in increasing lean body mass by enabling protein to be turned into muscle. It improves cells’ sensitivity to insulin, resulting in improved glucose absorption within cells and is thus recommended for ‘pre-diabetes’ or type 2 diabetes. This new form of chromium has been formulated to preserve the chromium in its trivalent form (Cr3+), offering better consistency, and in particular, significantly improved bioavailability. • Polyphenol antioxidant compounds in Capros®, a patented fruit extract of Phyllanthus emblica, also known as Amla (Indian gooseberry). These polyphenol compounds are excellent antioxidant ligands which prevent chromium in its trivalent state - a safe and effective state - from being oxidised into toxic Cr6+, by covering all the coordination sites of Cr3+. Amla is now also recognised for its effects in regulating blood sugar and complications of diabetes (particularly those of the kidneys), its beneficial effects thus complementing those of chromium. • Fulvic acid from PrimaVie® (a patented and purified Shilajit extract) which acts as an effective support molecule and enables the Cr3+ to travel to insulin receptor sites, thus increasing chromium’s bioavailability. Shilajit is also known to maintain and restore cellular energy levels by helping the mitochondria to convert fats and sugar into ATP (adenosine triphosphate), one of the body’s two main sources of energy. Crominex® 3+ is obtained through an entirely aqueous process which enables all its active principles to be retained. Crominex® 3+ is guaranteed to be completely free of toxic Cr6+, while chromium picolinate and chromium nicotinate samples tested did contain it. Either on its own, or in synergy with two allopathic active substances widely prescribed for type 2 diabetes, Glipizide and Metformin, Crominex® 3+ is effective at reducing fasting and post-prandial blood sugar levels, glycated haemoglobin (HbA1c), hsCRP levels and microalbuminuria in diabetics. Crominex® 3+ - combined with these two substances - reduces micturition frequency, general weakness, dizziness, excessive appetite, tingling of the skin and arthralgia in diabetics. In addition, studies on moderately-arthritic dogs have shown that administering Crominex® 3+ reduces joint pain during manipulation of limbs and following physical exercise. maintain a healthy weight and muscle mass in conjunction with regular exercise. Each vegetarian capsule provides 200 µg of trivalent chromium, 3mg of Capros® (Phyllantus emblica) and 3 mg of PrimaVie® (shilajit extract). 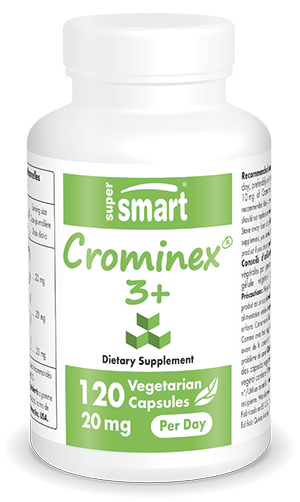 For optimal efficacy, one to two capsules a day of Crominex® 3+ is recommended, preferably with meals. Adults. Take one or two vegetarian capsules a day, preferably with food, or as advised by your therapist. Each capsule contains 10 mg of Crominex® 3+.